Sponsored Post: Divorce is painful for children, no matter how old they are. How kids deal with divorce greatly depends on their age and level of maturity. While younger children may cling to parents, teenagers often pull away and become uncharacteristically rebellious. To make things even more complicated, social media has made the landscape much more dangerous. However, there are warning signs you can look out for, and the good news is that there are clear ways to make the separation and divorce process easier for teens. Always keep in mind that although your teenager may appear mature physically, he/she is still growing emotionally, and is not an adult on the inside. Teens have a lot going on, and divorce can pile on more drama than they are equipped to handle. They may feel angry and embarrassed. Or, they might feel responsible and blame themselves. Teens often feel torn between their loyalties to each parent. 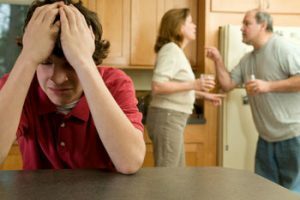 When children have been dealing with disharmony and parental fighting for a long period of time, divorce may even come as a relief. Remember, this is also the time that adolescents start thinking about their own future love life. Divorce may make them feel like they have less chance for success in love. This is all very scary and confusing for a teenager. The teenage years are when adolescents begin to strive for more independence from family. Sometimes this desire accelerates with divorce. Kids may withdraw emotionally as a form of punishment. They may put their peers ahead of family time more than usual. This can make teenagers more susceptible to drug /alcohol abuse or sexual promiscuity. It’s very important to set limits and enforce rules, while also being flexible and understanding. Your teen may not want to visit the non-resident parent. Neither parent should take this personally, and teens should be given some say in visitation schedules while still maintaining routines. Letting your child bring a friend during visitation is sometimes a nice compromise. These days, almost all teenagers have cell phones and multiple social media accounts on Twitter, Instagram, Snapchat, and many other platforms. Make sure to enforce the same rules about cell phones and posting at both parents’ homes, and monitor social media activity. Clearly explain that everyone MUST keep personal family information and situations out of posts. Aside from obvious privacy concerns, when personal information is broadcast in a public forum, it can impact your divorce case. Encourage your child to talk about his/her feelings. Be available and make sure they can always reach you. Teens need to be able to talk to either parent whenever they want, even if it’s during the other parent’s scheduled parenting time. If you are uncertain about your child’s well-being, be sure to seek professional help. – Never try to be a friend rather than a parent, and DO NOT allow underage drinking or illegal activities to occur in your home. It is achievable to have an amicable divorce, and to start a healthy new life for both you and your children. About the author: Attorney Robert G. Tukey is a Director at Suisman Shapiro whose practice concentrates in family law. Contact him via email at rtukey@sswbgg.com or via phone at 860-442-4416 with questions about divorce and custody matters.